Since the moveable feast that is Easter is late this year, I thought it appropriate to re-post (and update) a piece I wrote in late-2009 for the excellent Friday Forgotten Book series on Patricia Abbott’s blog. When she asked at the time, I didn’t know what I’d examine. Then it came to me: William Peter Blatty‘s The Ninth Configuration. It was the out of the ordinary novel I read the same year my mother passed away, and I’ve cherished it ever since (still have the book, in fact). Others, too, have praised the work. My good friend Corey Wilde wrote a great and thoughtful review during that summer, and another blogger friend, christian, wrote an equally first-rate review of its film adaptation for his Easter/Passover post last year. For me, it remains a remarkable and strangely reflective work. Just say the name, William Peter Blatty. It does have its own sense of meter as it rolls off the tongue, now doesn’t it? You’ll most likely recognize it, too. Just the same, saying it three times in front of a mirror won’t cause anything bad to happen, either — contrary to urban legend. If you love books and reading, whether you are a baby boomer or Generation X, Y, or even Z, odds-on you’ve heard of him. Such is the legacy of authoring a horror novel as famous as 1971’s The Exorcist (which would go on to even greater notoriety when it was adapted to the screen in 1973’s film of the novel). However, along with the popularity and fame for a book that became an all-encompassing event, it can be too much of good thing. ‘Event’ novels can take on a life of their own, and they can build to the point that all other work by the same author lies in its shadow. Obscured because they are not anything like that book. Such was the consequence for the next novel by author Blatty that it seemed to fall by the wayside when it was published in 1978. That forgotten, but wonderful, piece of elegant writing was, The Ninth Configuration. Luckily for those of us who read the re-envisioned work in the late 70’s (and those who would go on to discover and appreciate it decades later), it is an overlooked title worth remembering. Ironically, Mr. Blatty has said more than once he considers it his unofficial sequel to The Exorcist. 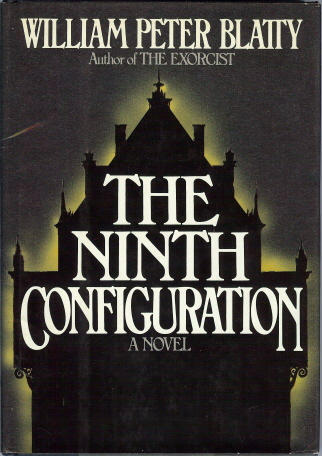 Although The Ninth Configuration shares a very loose connection (via an unnamed character) from that novel, the genre and plot line couldn’t be more divergent. Plus, it works whether or not you’ve read the legendary blockbuster that preceded it. The novel’s story centers upon a select small group of military men secluded away with what are believed to be inexplicable mental disorders. Or, being highly intelligent men, they could be faking it — which could be the reason nothing has worked and why they continue their stay at a decaying Gothic mansion. Their treatment, and sanity, ultimately hinges upon one Marine Colonel Kane (a psychiatrist who may have his own issues) brought to the sheltered facility to seek the answers in the most unexpected of ways. Blatty crafts the story as a mystery to be solved, planting its seeds in the unusual interactions that take place. While the material covered is meaty, it is one of the few novels that made me laugh out loud, and had my eyes welling by the time I finished it. One could describe William Peter Blatty as an author who writes eloquent, intriguing fiction that draws in his readers with clever, humorous dialogue (keep in mind, he also wrote the screenplay for the comedy, A Shot In The Dark). Or put another way, he’s a humorous, clever writer who puts out eloquent novels that catch the readers off guard by being thought-provoking. I’d say both are true. He just happened to author a chart topping novel of horror that eclipsed everything before, or since, in his bibliography. However, The Ninth Configuration remains perhaps a more intriguing read, and worth exploration by those who haven’t experienced it. As well, for those of us who are film buffs, sprinkled throughout, the author references classic movie moments and dialogue within this novel. A few years after its publication, William Peter Blatty would pen and direct its film adaptation in 1980. Not surprisingly, that motion picture has developed a strong cult following, and many believe the story is more immersive on the screen. I have deep affection for both book and film. The 1978 novel is a svelte 135-page work, and last year TNC was be re-released by Centipede Press as a new edition. It combines both novels, and includes a long essay by film scholar Mark Kermode, in a 292-page hardcover. So on this Friday (once again), The Ninth Configuration is not forgotten (at least, by me anyways). The Exorcist was written by a genius, so I always haved believed. I had never investigated the author and find your post very interesting and enlightening. Will be on the look out for a copy if the 9th …. I think you’d appreciate it, Herb. His official Exorcist sequel, Legion (and its film adaptation, Exorcist III), is also quite good. Thanks, my friend. Well done le0pard. Blatty is a strange author but a rewarding one. It’s been nice to see his reputation grow in the last few years. I couldn’t agree with you more, Bryce. Thanks, my friend. The first editions are definitely gathering value. I’d be interested in your thoughts on this one. Thanks very much, Rachel.